When the actual photograph arrived, the house certainly looked familiar, but the first few attempts at verifying its location failed; while it was similar to those at the northeast corners of both 18th and P Street and at 15th and Q Streets, it was clearly not the same house. 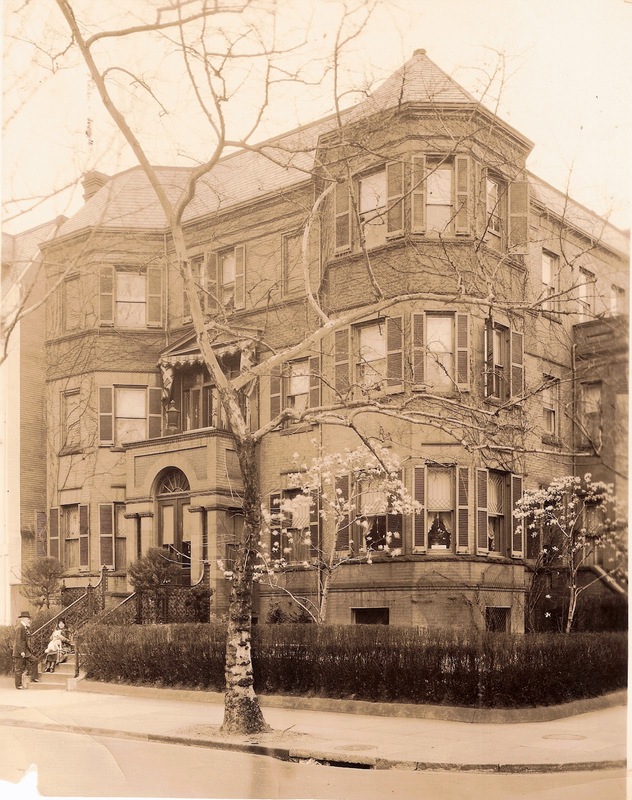 Similar attempts at locations matching an address of 1401, of which there are dozens off of 14th Street, also failed to reveal a match, and the photograph was left in the archives, with the thought that the large, windowed house was long ago razed, perhaps located at what is today 14th and K Street. About a year later, the photograph surfaced again, and when looked at with fresh eyes, it was envisioned without shutters, and the Dupont east neighborhood came to mind. Rather than focus on all the alphabetical streets off of 14th Street, a search for those just north of O Street, in the 1400 block of the numbered streets quickly found a match, verified with Google earth: the house still existed at 1401 21st Street, NW. The house didn’t face south as previously thought, but west. Perhaps the house seemed familiar because I lived close by at 2032 O Street, NW for two years, beginning in 1991. The building permit indicated that it had been built on the northeast corner of 21st and O Street beginning in May of 1895. It was designed, built, and first owned by artist Louis D. Meline (1853-1905), better known for his still life’s and portraits in oil. In fact, he was only listed as an architect for six years in the City Directory, from 1899 to 1905. He resided close by at 2025 O Street in 1895, and was no doubt a relative of the Assistant US Treasurer, James F. Meline who lived at 2111 O Street. The house was built at an estimated cost of $25,000. 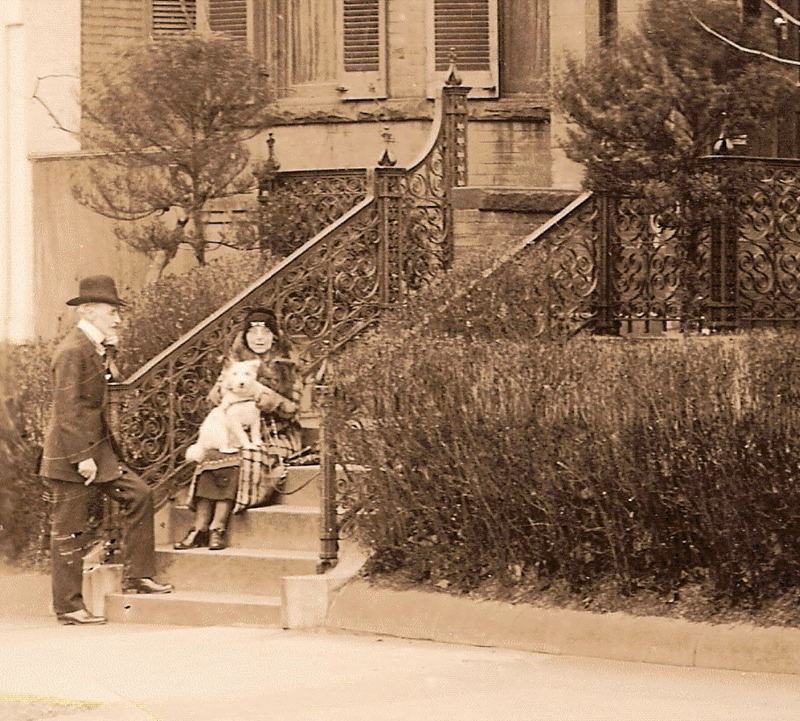 The land on which it was built on Square 96 was previously owned by John S. and G. W. Hopkins, the namesakes for Hopkins Place that runs north and south between O and P Streets, between 20th and 21st Street. Searching through City Directories, census records, and Elite Lists soon verified the Doctor seen at the front entrance of the house: it was Edward C. Carter, and his wife Helene. Known mostly as “EC,” he had been born in Virginia in April of 1856, and resided at the house in 1900 along with Helene (born 1868), and their daughters Sylvia (born 1894), and Evelyn (born 1898), and apparently their dog “Terry.” They were attended to by a 21 year old German born live-in servant. Dr. Carter and Helene had married in 1894, just a year before the house was built. Dr. Carter was a physician for the US Army, having been commissioned a first lieutenant in October of 1881. He was also a religious person, and soon aligned himself with the Young Men’s Christian Association (YMCA) in this city, and abroad: beginning in 1902, the family moved to India where Dr. Carter oversaw 114 general and student YMCA’s, with an aggregate membership of nearly 10,000 men and boys in Calcutta, Bombay, Madras, Bangalore, and Rangoon. Dr. Carter’s military career no doubt led to the house being inhabited next by Army Col. John F. O’Ryan, and his wife, the former Janet Holmes. He had been born on August 21, 1874 in New York City, and graduated from the City College there in 1891. He obtained a law degree from the University of New York in 1893, and would eventually graduate from the War College in Washington, DC in 1914. His military career was secured in the history books when he was put in charge of the notable 127th Division in France during World War One, the only National Guard unit to sustain constant fighting throughout the War. 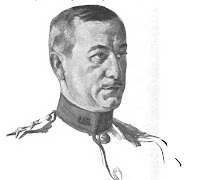 He authored several articles about the psychology of discipline that are still referenced in military training, and wrote a two volume history of the 127th Division in 1921. In 1940, O’Ryan traveled to Japan at the request of President Roosevelt in an attempt win the favor of the Japanese in assisting with the war against Hitler’s Germany. Ties were obviously severed with Japan on the bombing of Pearl Harbor in 1941. With the person and house identified at long last, perhaps in the future a living relative of Dr. Carter can someday be identified for a return of the image to its rightful owner.